FUNNVILLE - The Richmond Flying Squirrels, Double-A affiliate of the San Francisco Giants, released a special 10th season logo for 2019 on Tuesday night, kicking off the start of a year-long celebration of a decade of Flying Squirrels baseball on the Boulevard. 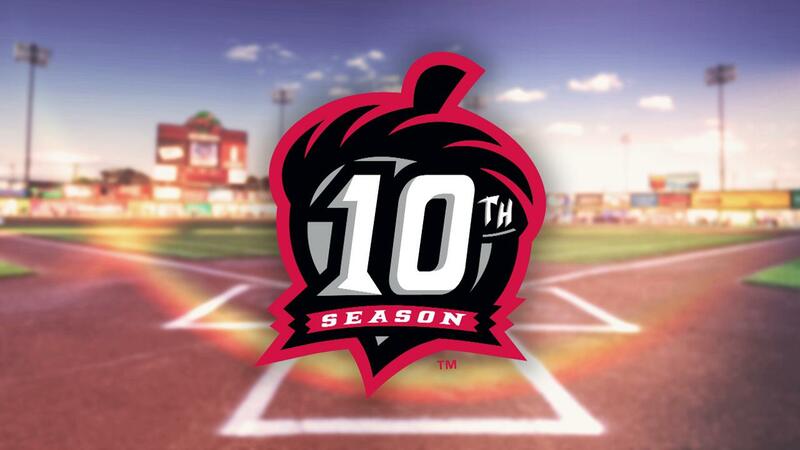 The logo, designed by Nick Elder of the Flying Squirrels, features an acorn shape surrounding the 10th season lettering, representing the seeds planted in the Richmond community over the last decade and the organization's growth into the future. "It's hard to believe this is our 10th season, but the memory making will continue at a rapid pace for a more-than action-packed 2019 season that includes, among many other things, the 2019 Eastern League All-Star Week and All-Star Game presented by Genworth," Flying Squirrels VP & COO Todd "Parney" Parnell said. "Our existence here in Richmond has been a love affair like no other and we look forward to that continuing in our 10th season and beyond." Over the team's first nine seasons, the Flying Squirrels have welcomed nearly four million fans, won two Western Division titles, seen 60 of their alumni reach the majors and established themselves as an integral part of the Richmond community. During their upcoming tenth season, the Flying Squirrels will host the 2019 Eastern League Celebrity Home Run Derby & Funnville Fan Fest and the 2019 Eastern League All-Star Game presented by Genworth at The Diamond. The Flying Squirrels are also the host team for the Topps Heritage® Make YOUR Pro Debut contest and one of 72 minor league teams participating in Copa de la Diversión, engaging the club with its local Latino community. Tickets are on sale now for the 2019 Hot Stove Banquet, happening January 23 at the Siegel Center with proceeds benefiting Flying Squirrels Charities. Tickets can be purchased at the Flying Squirrels Ticket Office, located on the first-base side of The Diamond, or online at squirrelsbaseball.com.